In previous articles, I have discussed how Premiere Pro CS5 can import native Canon 7D video (as well as video from Canon 5D Mark II/Canon T2i) without the need to convert the video from its native H.264 format. Once you drag the video to the timeline, there is a whole range of features to manipulate the video. One of the coolest (and easiest) effects is Slow Motion. Earlier version of Premiere were limited in how to create and manipulate slow motion video, forcing users to purchase third-party filters like Twixtor. But, Premiere Pro CS5 is so flexible that you have your choice of three different ways to apply slow motion effects. 1. Speed/Duration to an entire video clip. With the clip on your timeline and selected, just go to Clip > Speed/Duration to apply slow motion to the enitre clip. 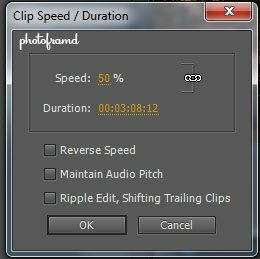 You can also use the short cut Ctrl/Command + R.
In the pop-up dialog box, change the value of Speed to less than 100% to slow down the entire clip. You can also increase the value of Speed higher than 100% to speed-up the entire clip. Both the video AND the audio for the clip will be altered accordingly. 2. Time Remapping in Effects Control Palette provides key frame control for video time effects. You will notice the handles on the key frame are split. This means that they can be pulled apart to further refine the transition speed. Click on one handle and pull to create a space in between the two side of the handles. That will reveal a bezier control point which will allow you to adjust the transition for the start of the video time effect. This point can be altered by pulling the blue points to speed-up the transition start or slow down the transition start. The same is true for the end key frame. 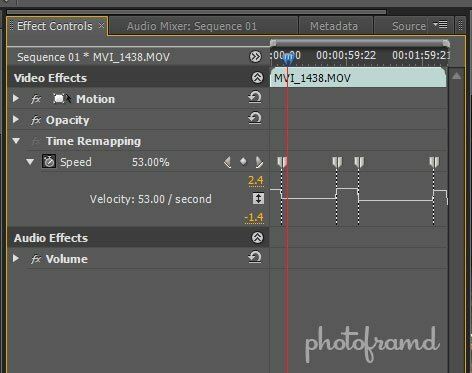 One important difference between Time Remapping and Speed/Duration – Time Remapping only applies to the video portion of the clip. The audio track will remain unaffected. 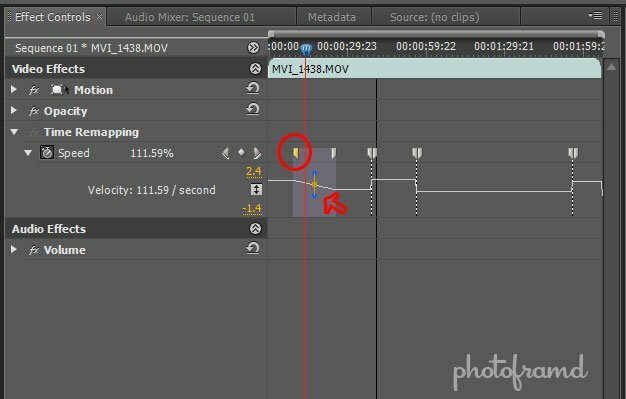 You will either need to Unlink the Audio and slow the audio track down using Speed/Duration or add in an additional (duplicate) audio loop to fill in the sound gap. 3. Time Remapping in the timeline directly. For those who like to work in the timeline, you can also use Time Remapping there too. Just click on the clip and select Time Remapping from the drop-down. All of the same features discussed above in the Effects Control Palette are also available here. Time remapping will also affect only the video clip. The audio track will remain unaffected. For additional information, take a look at this great video by Chad Perkins at the Adobe Video Workshop. Great, this is marvelous! I just stumbled on this site, and I’m glad I did. Thanks for sharing. 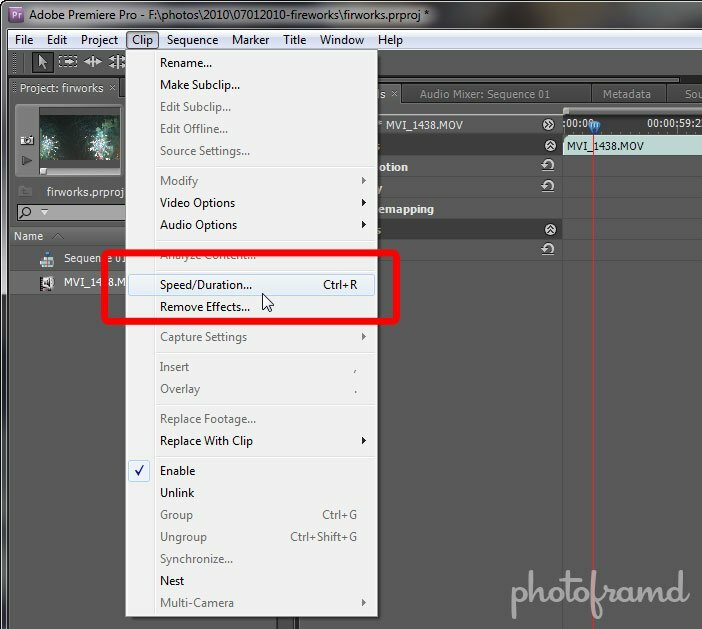 Now can you also show some of us how to use Pinnacle’s Hollywood FX in Premiere Pro CS5? We would really appreciate that. Thanks while waiting for answer. Pinnacle’s Hollywood FX is only available for the Pinnacle products. For Premiere Pro CS5 plugins, take a look at Red Giant Magic Bullet for color effects and NewBlueFX for a variety of transitions including Art Blends, Motion Blends, Paint Blends, 3D Explosions and 3D Transformations.